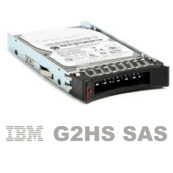 The IBM 300GB 10K rpm SAS-2 6GBps 2.5-inch SFF Slim HDDs provide a 2.5-inch form factor that can be used as Hot-Swap drives. The addition of a 300GB 10K rpm offering to the System x and BladeCenter blade family of 2.5-inch SAS HDDs makes it one of the highest-performing SFF options. These drives are positioned at the top of the SAS SFF HDD line based on increased performance and capacity.